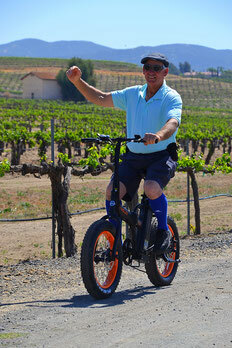 You’ll be cruising Temecula wine country in style on our fat tire electric mountain bikes! Designed for the easy breezy fun factor from pavement to dirt trails, our bikes are built to ensure that you have a wonderful experience on our cycling wine tour. Made of lightweight rigid alloy frame paired with a torquey electric motor that assists you in pushing your limits! Our bikes are also built with safety in mind with powerful front and rear disc brakes. Since everyone falls in love with our e-bikes they are available for sale too! So keep the good times rolling and take an e-bike home with you after your tour. Feel the wind against your skin as you glide through the countryside of Temecula wine country via state of the art electric mountain bikes! Your e-bike, vino-loving, tour guide will enrich your experience; providing fun facts from Temecula wine country to e-bikes whilst snapping photos along the way! Our route will guide you from pavement to exhilarating dirt trails! Additionally, you will be able to remember your two-hour experience with a souvenir BPA free logo water bottle! Your guided e-bike tour experience will be approximately two hours long. Starting your experience in the Temecula wine country, your route will take you from pavement to off road country and vineyards! 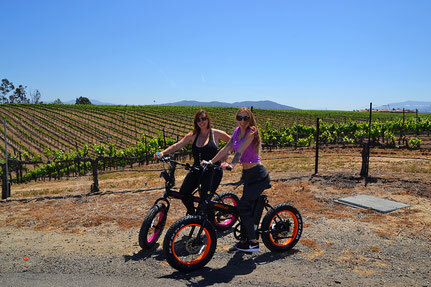 Your e-bike tour guide will enrich your experience; providing fun facts about the Temecula wine country to e-bikes while capturing photos of you along the way! Your experience concludes with a wine tasting at one of the oldest Temecula wineries and a souvenir wine glass and BPA free water bottle is included too! Yum-Yum for your Tum-Tum after a fun vineyard e-bike tour!